We built a new home and our original landscaper didn't do hardscape work which led us to Outdoor Creations, and we liked Jeremy's presentation and planning from his first visit. Now every time we have a gathering on the patio we get compliments on how nice everything turned out and it reminds us that we made the right decision going with Outdoor Creations. 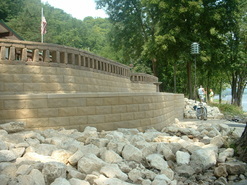 We needed a professional for our landscape job as we knew our landscape wall had to stand up to flood water waters, and a good design was imperative. We found Outdoor Creations on the internet via your website, and found your tribute to Brent heartwarming and very similar to what we experienced. Plus we could see based on your gallery that you had the skill sets we desired. If you want it done correctly, Outdoor Creations is the way to go. Look around and you will see many mistakes out there. I only want to do this once. We saw a waterfall display at the store when we stopped to get some plants one spring. The display sold us on their work and creative ideas. I liked Jeremy's ideas and suggestions. I liked the fact that if I am not 100% satisfied I can trust that they will do everything they can to make it right. All three projects turned out great and we are enjoying them immensely. Jeremy was very professional and patient explaining in detail what they could do for us. His pricing was up front with no hidden costs. After meeting with Jeremy we decided to do a much larger project. 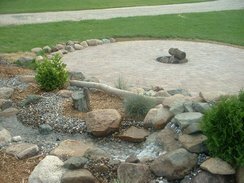 Outdoor Creations does excellent work, their prices are fair, and more importantly after the project is done they follow up with whatever service or repairs are needed to maintain the project. Jeremy and his team are a great crew. I love that they came when they said they would, and finished on time. The work they did for us was beautiful. Jeremy has a great artistic ability and created designs that fit perfectly around our home. It didn't matter that I didn't know what plants I wanted. He visited with me a while and then he was able to choose the plants that would suit me and my home, beautifully. I also appreciate that he doesn't just install. He comes back in the fall to pull our pump and again in the spring to put it back. He created something beautiful and then helps me keep it going. Jeremy was able to do exactly what I wanted and he came highly recommended, as many of my neighbors have had work done by Outdoor Creations.